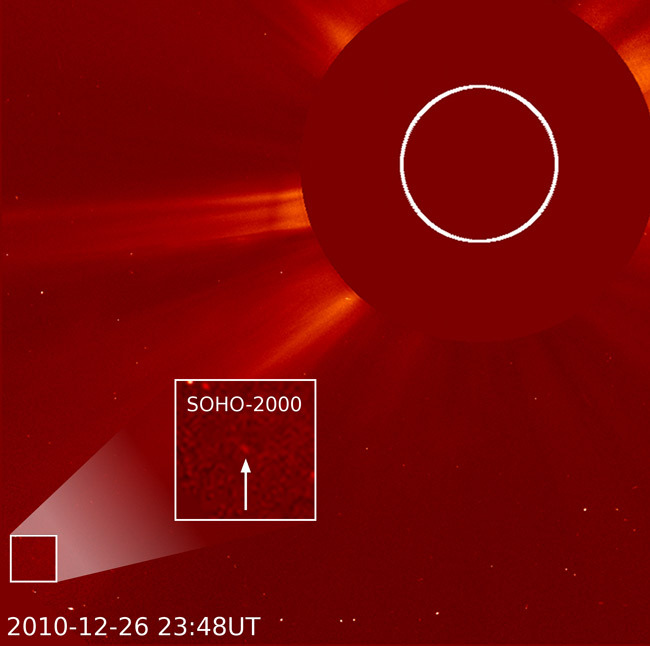 On 26 December 2010, the SOHO spacecraft clocked up its 2,000th comet. Helping in its quest, a network of devoted amateur astronomers keenly pores over each image acquired by the probe’s U.S.-European coronagraph. 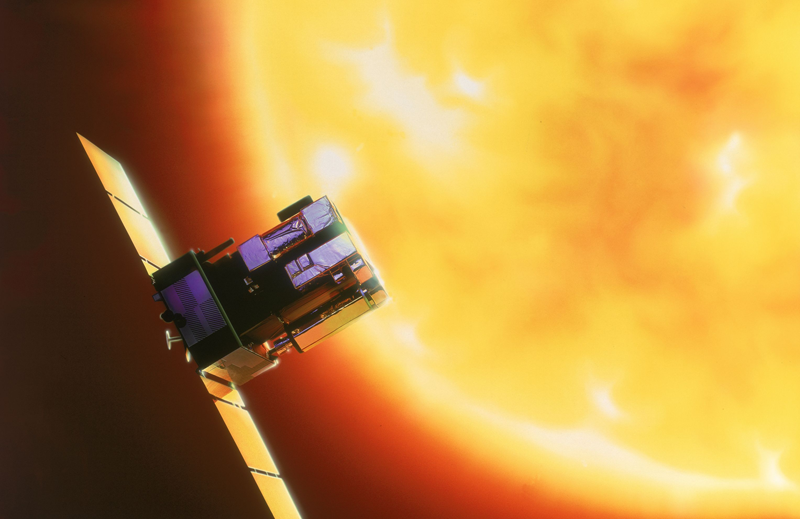 The SOHO spacecraft, in orbit since 1995. Credits: ESA. Every month, ten or so comets are teased out of the pictures obtained by LASCO1, the coronagraph on SOHO. The instrument masks out the Sun to reveal light-emitting objects within its vicinity, notably comets. And so it was on 26 December 2010 that Michal Kusiak found SOHO’s 2,000th comet. SOHO’s 2,000th comet. Credits: SOHO/Karl Battams. 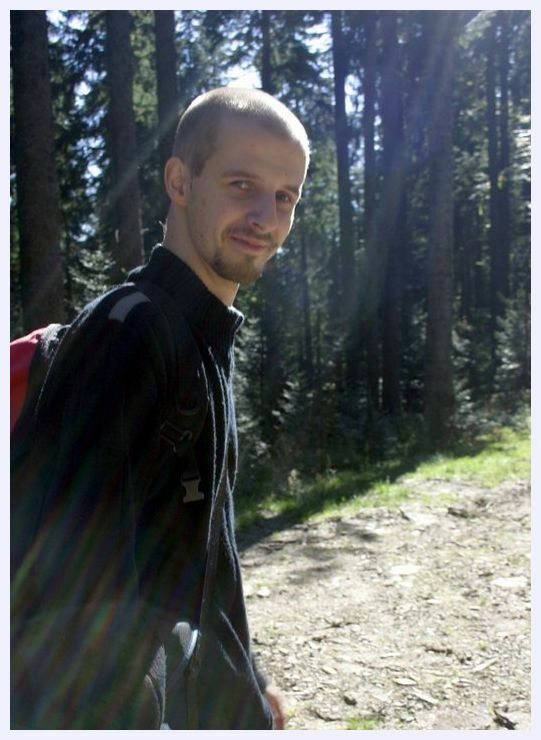 Michal Kusiak is a Polish student and amateur astronomer. Like many other keen amateurs, this young man loves sifting through LASCO images on the mission website in an attempt to spot comets, which most often appear as tiny dots of light. Michal Kusiak, the Polish student who spotted SOHO’s 2,000th comet. Credits: Marcin Kusiak. Thanks to this rich harvest of sungrazers, scientists are studying the phenomenon of sublimation, focusing in particular on degassing of sodium, as well as the size of their core and the process of comet fragmentation. Their research has given rise to 10 scientific publications. 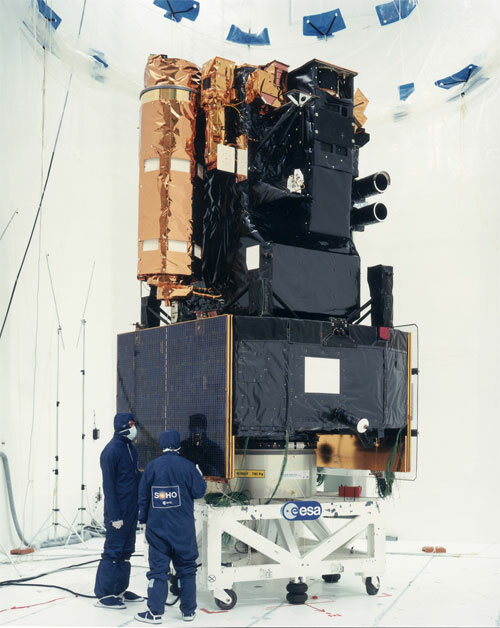 SOHO undergoes integration in 1995 in Toulouse. Credits: ESA. And because comets give off large amounts of hydrogen in their tail, they are immediately found out. “SOHO was launched in 1995 and is now starting to show signs of age. Some of its instruments are barely used any more. However, that’s not the case with LASCO, which will no doubt be the last instrument still left operating,” concludes Jean-Yves Prado. SOHO’s comet-hunting days are not over yet! 1 Large Angle and Spectrometric Coronagraph: Naval Research Laboratory (United States) / LAM astrophysics laboratory, Marseille (France) / Max Planck Institute for Solar System Research (Germany) / University of Birmingham Astrophysics and Space Research Group (UK). 2 Solar Wind Anisotropies: LATMOS atmospheres, environments and space observations laboratory (France) / Finnish Meteorological Institute (Finland).